The queen of coats, Kate Middleton embraces royal blue as she makes a visit to Dundee, Scotland in this full length wool dress coat, fittingly designed Christopher Kane. While attending the Christina Dior show at Paris Fashion Week, Rihanna wore what can only be described as her most oh-em-gee coat ever (yes, even more so than that gold Met Gala cloak) in the form of this candy pink asymmetrical design. January Jones teams a feminine dress with an over sized brown blazer for a quirky mixture of style while attending a polo game. It’s something of a Mad Men twist as we envision Roger Sterling kicking back with a whiskey in a similar piece. Jennifer Lopez sports a hounds tooth printed wool coat while attending the New York premiere of Rock the Kasbah, teaming her lust inducing look with black pants, a turtle neck crop and pair cat eye glasses. Selena Gomez embraces the ‘70s trend that’s taken over this season by rocking a fur trim, long line leather coat at Paris Fashion Week. Groovy baby. Kendall Jenner dons the ultimate camel coat while attending London Fashion Week. The perfect piece dressed up or down, the fashion muse teams her single breasted coat with powder blue pants and a white crop top. 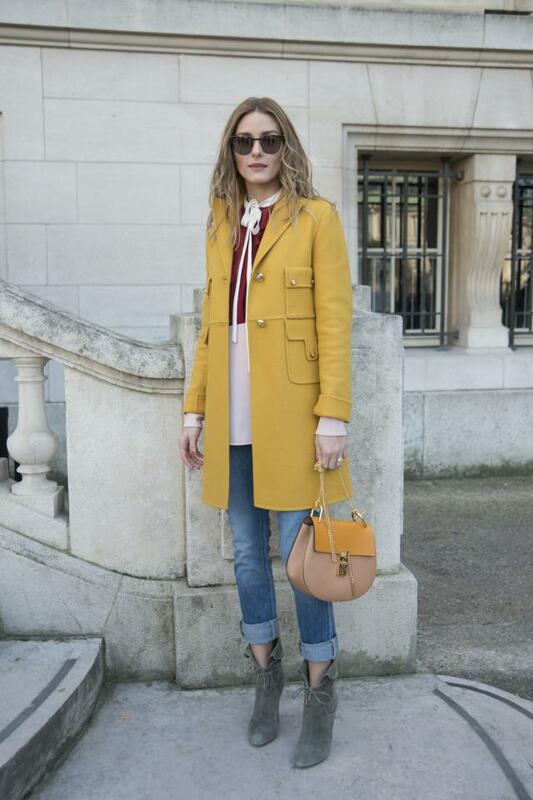 Olivia Palermo inject a little summer sunshine into her winter ensemble while attending Paris Fashion Week, opting for a canary yellow military inspired coat with statement pockets.